her journey to becoming Britain’s longest and oldest reigning monarch.This stunning Silver layered Crown Coin features the fourth of these portraits by Arnold Machin. 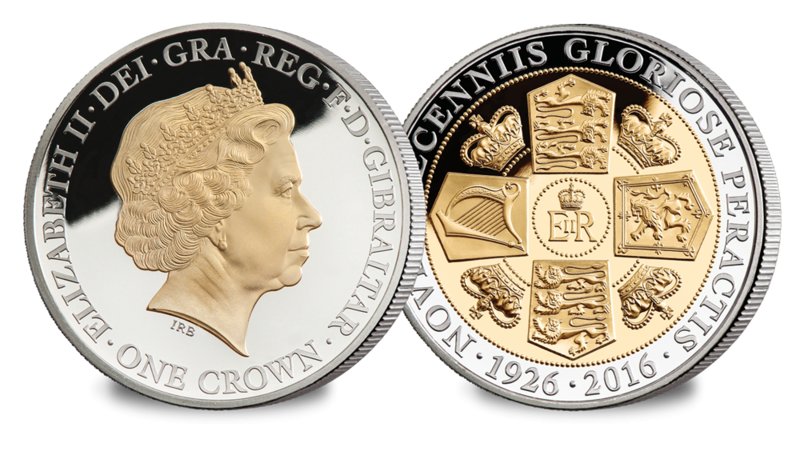 In 1998 the Queen’s effigy was updated once more after the wonderful portrait on the Golden Wedding Crown had sparked interest in a new portrait for the coinage. A design by Ian Rank-Broadley FRBS was chosen as the Queen’s fourth coin effigy. More strongly realistic than the previous portrait, Rank-Broadley’s effigy shows a mature Queen, ‘a seventy-year-old woman with poise and bearing’. With the introduction of new, smaller 5p, 10p and 50p coins in the 1990s, Rank-Broadley was also aware of the need to make the Queen’s head as large as possible and his portrait remains crisp and visible even on coins as tiny as the 5p. The reverse symbolises the shields of the Royal Arms. Located at the north and south positions are the shields that represent England, containing three lions passant. A lion rampant represents Scotland in the east position, and to the west is a harp that represents Ireland. The four quadrants depict the St. Edwards crown, encircled by the Latin inscription ‘NOVEM DECENNIS GLORIOSE PERACTIS’ (nine decades gloriously accomplished). The year dates 1926-2016 to represent Her Majesty’s 90th Birthday.